Here are my thoughts on our first Easter without children at home. It was a trend that has continued. Happy GOOD FRIDAY and EASTER everyone! Enjoy the time to celebrate together with friends and family. There won’t be an egg hunt at my house this year. That’s because my husband doesn’t want to dye eggs with me. Add that to my dislike of eating egg salad all week, I’ll have to get over the no Easter egg sadness. It’s the first year that we haven’t had a child home for Easter. Last year, I forced my 18-year-old to hunt for eggs. She grudgingly dyed the eggs I boiled after I nagged her a few times. 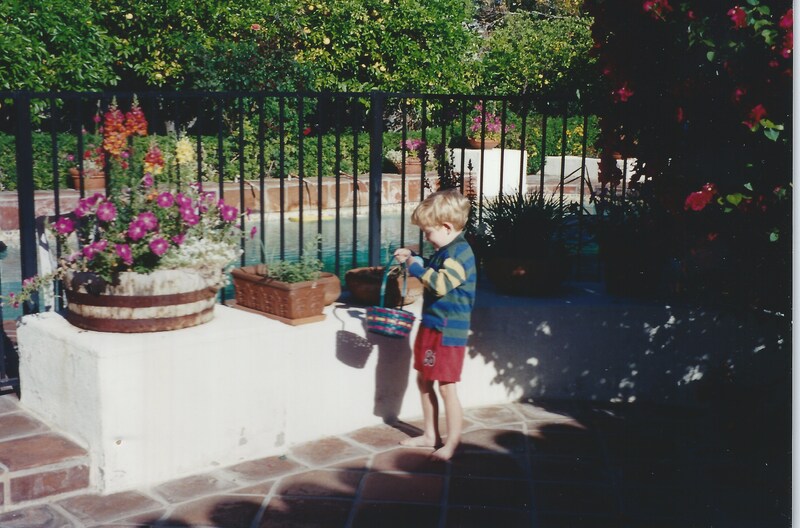 Easter morning, I hid them outside around our patio. I think she really did enjoy looking for them. At least, she went through the paces. 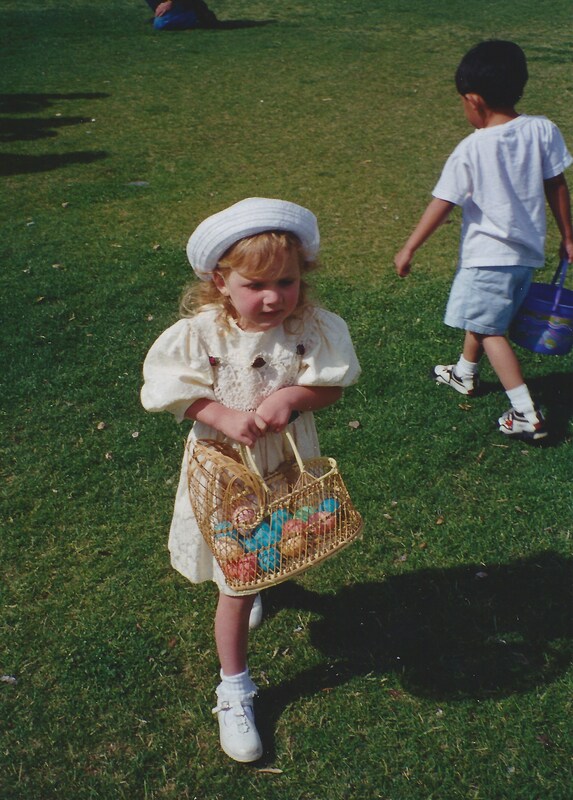 Kat at the Fireman’s Annual Egg Hunt. This year, I’ll skip it. Somehow I can’t imagine my husband hunting for them. Or me. After I’ve hidden them. Yes, that would be sad. Instead, we’ll walk over to O’Donnell golf course for sunrise service. It should be a gorgeous morning up against the mountain with spectacular views. I’m thinking the last time we did that was before we had kids. We went with our good friends and sat on the dewy grass on a plaid wool blanket. Funny thing. I see a pattern where we are returning to activities that we haven’t had time to enjoy in years. 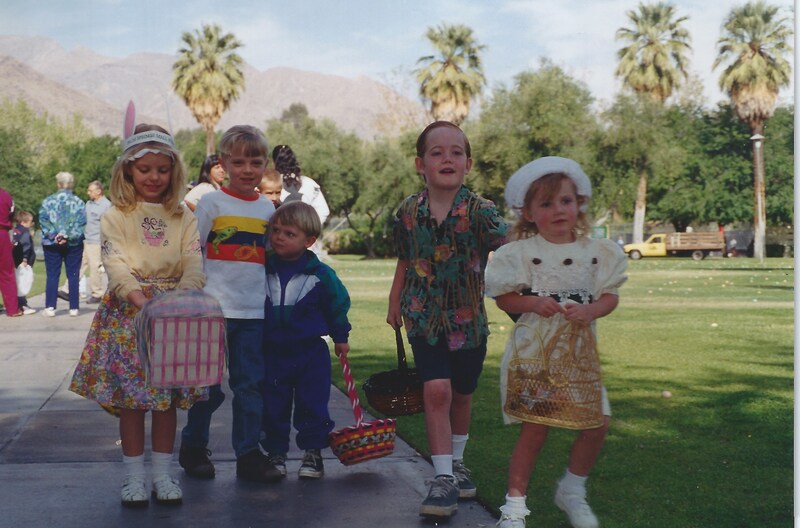 My kids and friends at the annual egg hunt. My husband just said, “Let’s go to the beach.” We used to pick up our stuff and jump in the car on a few minutes notice and have a beach day. That was before swimming and school activities took over our lives. I think I can get used to this. As a baby boomer who loves hanging out with my adult kids, I found this article in the Wall Street Journal called “Baby Boomers and the Art of Parenting Adult Kids” by Clare Ansberry to be right up my alley. “More involved with grown children than previous generations, many boomers struggle with letting them go” was the tag line to the story. Hmm. I’m not sure how I feel about that. Am I struggling to let my kids go? Or, do I simply like hanging out with them? I had a trip to Nor Cal to hang out for a few days with my son and his girlfriend, and I treasured the trip. I don’t go up to San Francisco very often, mostly because it’s too far and it costs a lot. My son treated me to some great sightseeing including hiking up to Indian Rock to see the sunset, a trip to SF MOMA and the Sutro baths. We had some incredible meals including Belotti and a Chinese restaurant where I watched them roll out fresh noodles in the window called Shan Dong. On my trip, I visited a swim team in Roseville, California Capital Aquatics, and talked about things swim parents need to know so they don’t make the same mistakes I did. That was a blast, and having my son take time off work and drive me there, gave me a boost of confidence. He seemed to enjoy what I had to say and was encouraging. Linda Hoskins would like to believe her adult son considers her a friend. She’s a baby boomer and boomers tend to think they’re cooler than their own parents were, she says. “Therefore why wouldn’t our kids want to hang out with us all the time. We’re their friends, right?” the 69-year-old executive director of the American Pie Council asks half-jokingly. Her son sees it a little differently. “She’s my mom,” says Rick, 44. While very close—seeing each other several times a week until she recently moved and texting in between—his mom isn’t on the same level as his friends, nor would he want her to be. Baby boomers are far more immersed with their own grown children than their parents were with them, says Karen Fingerman, a professor of Human Development and Family Sciences at the University of Texas, Austin. She found that parents in the early 2000s offered about twice as much counsel and practical support (which could be anything from babysitting grandkids, running their grown kids’ errands or reviewing their résumés) as parents did in the 1980s. Such deep ties can make it hard to let kids go or accept that they will likely love their children more deeply than their kids can love them. Don’t give unsolicited advice. If they want your opinion or need your help, they will ask. Let your kids make mistakes. You did and learned from them. Make a life of your own, so your children don’t feel guilty as they move on with their own life. Manage your own expectations. The fewer expectations, the less likely you are going to be disappointed when they don’t call or visit as often as you would like. Keep in touch in ways that are meaningful to them, whether that’s texting, FaceTime, or phone calls. Set limits. If you can’t or don’t want to babysit all the time, let them know. “My kids use language like ‘my family’ and ‘our family’ and they don’t mean us,” one man commented. “I’m at the mercy of their whims. We see them when they want, not when we want,” said another. “I miss my kids. I want to be around them more,” one woman said. It’s not that grown kids don’t want to be part of a parent’s life, but that they are really busy, says Dr. Stroh, herself a boomer and mother of two children, who are very involved with their careers. “If I get a call, I’m thrilled and flattered,” says Dr. Stroh, who teaches human development at the University of California, Santa Cruz. Pittsburgh resident Art DeConciliis, 58, remembers when he and his wife, Mary Pat, got married. “It was sink or swim,” he says, their parents offering little help or support. Today, his three adult children, all married and living near their Pittsburgh home, frequently call for advice about work, buying a house and starting a family. He’s happy to offer it. “My self-identity is very closely tied to my relationship with my children. I don’t think that was the case with my dad. His was wrapped up in his business,” he says. While he sometimes wonders if too much advice-seeking and advice-giving is a good thing, he also felt a little disappointed that his youngest daughter didn’t involve him when she and her husband bought a house. That daughter, Samantha DeConciliis-Davin, 26, says that while close to her parents, she has always been independent. Buying a house without their input wasn’t a slight as much as it was an affirmation of their lifelong guidance. “I still depend on them for advice,” she says. They are the first ones she calls if something happens at work. Kathy McCoy, a psychotherapist specializing in family dynamics, says some distance can be a good thing. Kids should refrain from telling their parents everything and parents should refrain from trying to direct their adult child or grandchild’s life. “That distance can lead to a new kind of closeness,” says Dr. McCoy, who wrote “We Don’t Talk Anymore,” about estrangement between parents and their adult children. My adult son at SF MOMA. If you’re the parent of adult kids, do you think you’re struggling to let your kids go, or like me, do you like to spend time with them? The view from my back door. We are thinking about selling our empty nest — the home we moved into 27 years ago — before kids. We started off just the two of us, plus a dog and cat. Now we’re thinking about leaving. When my husband first brought this concept up, I burst into tears. “But my babies! I had my babies, here!” I blubbered with tears running down my cheeks. Actually, I had my two children in the hospital, down the street, but you understand. Our family was raised in this house. It’s filled with memories of them in a basinet, crib, bunk beds, to the big beds standing empty now in their rooms. Kids coming over. Christmases, birthday parties, swim friends hanging out. Senior prom pictures and all. My daughter using the tub to stand. My son in his bedroom. My view writing on my laptop. My son is fighting us tooth and nail. According to him, we’re never supposed to sell California real estate. The property is by all rights his and his sister’s — they’ve laid claim to it. Interesting, I never looked at it like that. I’m wondering if they can afford the AC, the pool man, the gardeners, all that stuff we’ll be hoping to get rid of in retirement. I never thought I’d want to sell, but maybe it’s time? What are your thoughts about selling the family home and down-sizing? When is the right time? My back yard 27 years ago. Me and my two kiddos. Every generation has a fresh take on parenting, its own personal stamp on how children should be raised. Lately, though, it seems we hear of a new style every few weeks. First there were attachment parents and helicopter parents, and now come the snowplow parents. This last group is particularly infuriating because it means just what one might expect: to remove all obstacles in the path of a child. In other words, instead of preparing the child for the road ahead, the parent prepares the road itself. They plow it and pave it and block traffic. Sometimes, as in the case of the parents in the college admissions scandal, they even commit fraud. As far as parenting styles named for heavy machinery are concerned, it seems that snowplows deserve more ire than helicopter parents — characterized as those who hover too close — because snowplows do more than hover. They do the work, sometimes even the dirty work, for the child. Of course there’s a big difference between over-parenting and engaging in criminal activity. Either way, I’m curious if there’s anything positive to glean from the revelation of how far some parents go to shelter their children from the travails of growing up. How did we get here, by the way? And what can parents of more modest means (and probably stronger ethics) do instead to better prepare their children to succeed in the world? She goes on to say, let kids experience failure. Failure is good for our kids and especially when the stakes aren’t too high. For example, if they fail at a test in high school, it’s not as important as in college when classes cost a ton of money. Failure needs to be looked at as an opportunity to learn. If we swoop in each time to save the day, our children won’t learn the lessons they need to move onto the next phase of their lives. Their days “adulting” will be filled with anxiety and stress, because we robbed them of necessary experiences. Just saying, from my own experiences. First, let’s remember: Failure is good. Not all the time, not as a way of being or way of life. But failure teaches kids resilience, creativity, and prioritization. Through failure, we learn what matters enough that we are willing to work relentlessly toward it no matter how many times we fail; or we learn to adapt and recognize new opportunities when something doesn’t work out. When it comes to parenting, there is no one-size-fits-all approach. Each kid is different. The strengths and resources of parents vary greatly. And yet, one technique stands out for me, which can be summed up in two words: Be present. Practically speaking, babies and toddlers do not exist anywhere other than the present moment. When they are hungry, hunger is all that exists. When they are in pain, pain is all-encompassing. Older children understand the concept of time, but their needs are only slightly less immediate. You can reason that you’ll go to the playground not today but tomorrow or request that no one wake you before 7 a.m. on Saturdays, but a child of any age still often needs a response in the moment. When it comes to parenting, the most important question might not be which style we choose, but how we show up for our children in a given moment. One moment after the other. Every day. Year layered upon year, like tiers of birthday cake or bricks. Granted, no one is perfect, never distracted, or immune to a bad mood or short fuse, but before we can be “good” parents, we must first be present ones. We can borrow wisdom from all kinds of parenting styles: from Montessori or Tiger Mamas, attachment or anything goes, but it all seems secondary to the question of whether our faces light up when they enter a room. Do we take the time to be attentive in their presence? We teach kids to stop and look both ways before crossing the street. It’s a crucial safety precaution, but it can also serve as mindfulness inspiration as parents. How often do we take pause, stopping to consider what is happening as it’s happening, rather than merely reacting? As parents, do we have a stop-and-look equivalent as the moment is unfolding? Being in the present is important when you have adult kids, too. It’s also something to remember when you’re with your spouse. Are you preoccupied on your phone while they are talking to you? Are you nodding your head in agreement without listening? Most people are distracted because of our phones. When our adult children call, get off the computer or whatever else we’re doing and pay attention. If we’re distracted all the time and not really “there” we may find ourselves in a day and time when nobody is calling anymore. Stop. Breathe. Be here, in this moment, with yourself, with your kid whom you love. That’s the job. Leave the plowing of snow and hovering at 460 rotations per minute to the heavy machinery. What are your thoughts about being in the moment with the people you love? I posted this Easter week in 2014. There are a number of new movies released in the past five years that might be added to this list. Or, maybe some classics that I missed? Please comment below if you have more ideas for Easter movies. Around Halloween, it was Wizard of Oz and It’s the Great Pumpkin, Charlie Brown. Christmas had a bunch of great ones. My favorite was Rudolph the Red-Nosed Reindeer, but we also watched A Charlie Brown Christmas, and my Mom and Dad’s favorite — It’s a Wonderful Life. 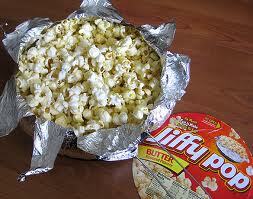 This Easter, I’d love to rekindle the tradition of sitting down with family to watch holiday movies together. Unfortunately, my son’s having a riotous good time at UCSB and my daughter will be off to see Lorde, Lana Del Rey, Beck and Arcade Fire. Yes, she’s going to Coachella! 1. The Robe. 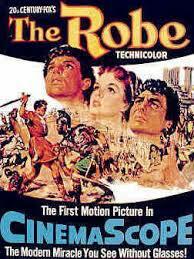 Starring Richard Burton, Jean Simmons, and Victor Mature. 1953. Won two Oscars. 2. 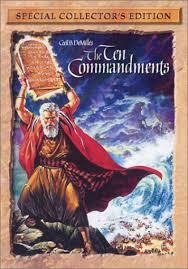 The Ten Commandments. 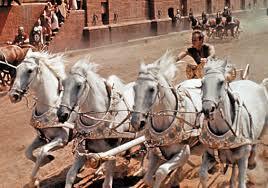 Charlton Heston, Yul Brynner, Anne Baxter. 1956. Won 1 Oscar. 3. 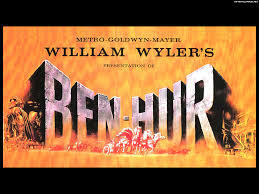 Ben Hur. 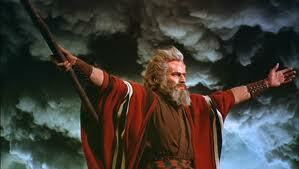 Charlton Heston. 1959. Won 11 oscars. 4. 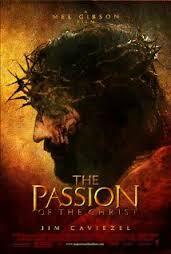 Passion of the Christ. Mel Gibson director. 2004. Not for the faint of heart! 5. 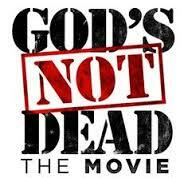 God Is Not Dead. I’m going to see this sometime this week. It’s made my list based on a friend’s recommendation. What other movies would you add to my list? Have you seen all five of these movies? I’m a cat owner. My cat is Olive and she’s going on eight years. We got her when my son left for college, because he’s allergic to cats. Olive is really my daughter’s kitty, but she didn’t take Olive to the snow in Salt Lake City during college, even though she’d do well with all her fur and polydactyl paws. We figured Olive likes her life here and I don’t think she’d do well to move to a new house. So, Olive remains my only pet now. I like it that way. In an article by Christopher Ingraham called “Dog owners are much happier than cat owners, survey finds” published in the Washington Post, he quotes lots of statistics that basically say that there’s little difference between pet owners and non-pet owners, but a huge difference in happiness between dog and cat lovers. The well-respected survey that’s been a barometer of American politics, culture and behavior for more than four decades finally got around to the question that has bedeviled many a household. In 2018, the General Social Survey for the first time included a battery of questions on pet ownership. The findings not only quantified the nation’s pet population — nearly 6 in 10 households have at least one —they made it possible to see how pet ownership overlaps with all sorts of factors of interest to social scientists. For starters, there is little difference between pet owners and non-owners when it comes to happiness, the survey shows. The two groups are statistically indistinguishable on the likelihood of identifying as “very happy” (a little over 30 percent) or “not too happy” (in the mid-teens). But when you break the data down by pet type — cats, dogs or both — a stunning divide emerges: Dog owners are about twice as likely as cat owners to say they’re very happy, with people owning both falling somewhere in between. Dog people, in other words, are slightly happier than those without any pets. Those in the cat camp, on the other hand, are significantly less happy than the pet-less. And having both appears to cancel each other out happiness-wise. (Since someone’s bound to ask, it isn’t possible to do this same type of analysis for say, rabbit owners or lizard owners or fish owners, since there aren’t enough of those folks in the survey to make a statistically valid sample). These differences are quite large: The happiness divide between dog and cat owners is bigger than the one between people who identify as middle and upper class, and nearly as large as the gap between those who say they’re in “fair” versus “good or excellent” health. However, correlation doesn’t equal causation, and there are probably a number of other differences between dog and cat owners that account for some of the differences. The General Social Survey data show that dog owners, for instance, are more likely to be married and own their own homes than cat owners, both factors known to affect happiness and life satisfaction. Previous research on this topic yielded mixed results. In 2006, the Pew Research Center found no significant differences in happiness between pet owners and non-pet owners, or cat and dog owners. However, that survey did not distinguish between people who owned “only” a dog or a cat, and those who owned “either” a dog or a cat, potentially muddying the distinctions between exclusive dog and cat owners. A 2016 study of dog and cat owners, on the other hand, yielded greater happiness ratings for dog owners relative to cat people. It attributed the contrast, at least in part, to differences in personality: Dog owners tended to be more agreeable, more extroverted and less neurotic than cat owners. And a 2015 studylinked the presence of a cat in the home to fewer negative emotions, but not necessarily an increase in positive ones. We’ve always had dogs, too, but currently are empty-nesters as far as the pups go. My daughter has Waffles the pug, who I get to babysit occasionally. I raised him from puppyhood for several months until she was able to come home and take him. It’s kind of what I think grand-parenting will be like. I love having Waffles around and then I miss him when he’s gone. But, I don’t miss the daily responsibility. Growing up we had big dogs. Golden retrievers, a doberman, German shorthair pointers and a yellow lab. As an adult, my husband and I got Natasha as a gift from good friends. She was a rottie and a housewarming gift for our first home. That was before kids and she did make us happy. She was our baby. Next pet was when someone found a kitten in their car engine on their way to work, and I ended up taking the poor sweet kitty home. That was Peabody, our second pet named for the cartoon series Rocky and Bullwinkle. Next came Sherman, who was a black cat that lived with us from kitten-hood to 17 years old when she wandered out of our yard and got attacked by the neighbor’s dog. Ugh. After we said good-bye to Natasha, we got Angus from Guide Dogs of the Desert. (I wrote about Angus here.) Angus lived until the ripe old age of 15. It’s so hard to say good-bye. It’s not fair that our pets live such short lives. I have two friends that lost their best friends in the past few weeks. One lost Beckham, her Aussie and another lost her glorious golden last week at eight years old. My heart grieves for them both. Lola (RIP) center, with Waffles and Gracie. What is your opinion on dogs versus cats? Do you have either or both and do they make you happy? Are Snow Plow Parents to Blame for the Cheating Scandal? Here’s a different take on the college admissions scandal where wealthy parents have been bribing coaches, athletic directors and SAT proctors to get their kids into the schools of their dreams—maybe it’s not the fault of being a snowplow parent after all. In the recent college admissions scandal, some wealthy parents allegedly bribed and lied to get their kids into certain colleges. Although we’ve known for a long time that kids from wealthy families have advantages in higher education, the criminal element of this story is new. Parents are getting arrested. Many of us have criticized these parents for such behavior. But along the way, some of us have gone further by criticizing their general parenting style. As a professor, I’ve had to deal with cases of student cheating, such as smuggling cell phones into tests or copying a classmate’s answers. Such behaviors are wrong, but I don’t extend this judgment to other aspects of the students’ lives, such as how they study or take lecture notes. Is it different for judging parents who break the law? Maybe. I’m definitely not trying to defend the alleged behavior. But several recent authors in The New York Times and elsewhere have gone further by using the scandal as a jumping-off point to criticize “snowplow” parents in general. In my view, everyday parents who seem to snowplow or hover get criticized enough without unfairly grouping them into a high-profile scandal. Snowplow parents are usually described as parents who clear their child’s way of every obstacle, or shield their child from any stress or failure. Helicopter parents are similarly described as wanting to “ensure their children’s success” (Darlow, 2017). A common criticism of all these parents includes the adage that we learn and grow from our mistakes and failures. I like the fact that this writer makes the distinction that the parents who broke the law aren’t just snow plow parents — they are doing something beyond annoying — they are acting immorally and illegally. While we helicopter and snow plowers may cross the line on what is helpful to our kids, we stop way before the illegal line. In my profession, if I get a call from a parent demanding I change their child’s grade, does that mean this parent is a snowplow parent? If a student makes a similarly unreasonable demand, does that mean they were raised by a snowplow parent? I don’t know. My first point is that there is an inability to see the whole at-home story based on a single behavior. This is partly to say that a particular parent might seem to fit a parenting label in one context but not another (Stalder, 2018). But even if the label fits a parent in general, I’ve observed other biases in criticizing snowplow (and helicopter) parenting. These biases include the strawman fallacy, dichotomous thinking, the converse error, and just not considering individual differences in children. I enjoy that the article discusses the fact that it’s not a one or the other situation. It’s not black or white. I think that’s true for me. I may hover in one area, and not in another. We are after all trying to do our best to raise healthy, happy and successful kids. Maybe we need a break on the labels and blame? Anyone else agree? What are your thoughts about the snow plow and helicopter labels on parents?